The best LinkedIn summary examples are like a strong handshake. They leave a positive impression, and they really stand out from the dead fish. Research shows that we make judgments about others within 30 milliseconds of meeting them. On LinkedIn, this means everything above the fold in your profile. Which is why we put together a science-backed guide to optimize your LinkedIn summary, with 7 unique examples to steal for yourself. Know when your emails are being read with invisible email tracking. Taking your LinkedIn summary from average to top-notch requires a few quick actions. 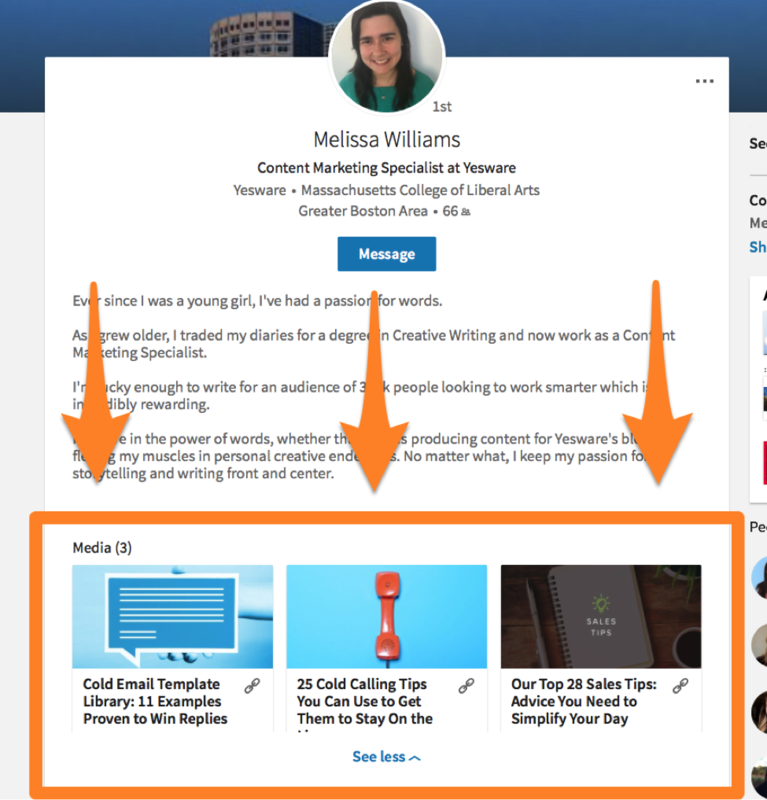 From rhetorical decisions (your main purpose, using first person) to going above and beyond by adding value (keywords, uploading media), you’ll need the right ingredients to write the perfect LinkedIn summary. In the world of LinkedIn, you get what you give. So, if you don’t know what the main objective of your summary is, you can bet that your audience won’t give you the response that you want. Before you start writing, think of your ultimate goal, then plant the seeds. This guides your audience towards taking the action. For example: If you’re on the job hunt, your goal would be to get recruiters to look at your profile. You could list your skills, qualifications, and a call to action for contact. LinkedIn gives you 2,000 character limit, but stay under this. According to eyetracking research, people are going to skim through your profile opposed to reading it fully. 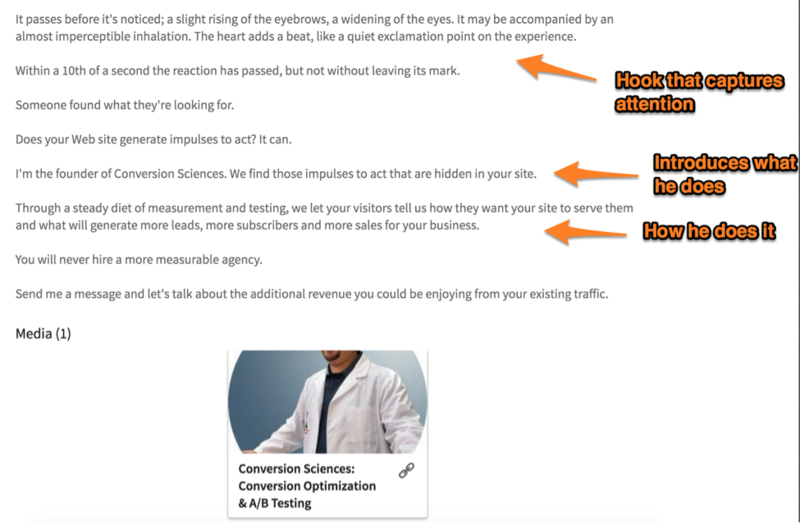 Make sure you fit your must-read info upfront, and remember: teasers get people to expand. Referring to yourself in the third person creates a distance between the “I” and “he.” So if you have an exaggerated view of how great you are, you could be using this distance to make yourself even bigger. Or, if you’ve achieved major success suddenly, using the third person could be a way to adjust to the bigger role that’s been assigned to you. It’s a way to enlarge yourself to fit that role. It’s safe to say that sticking with first person makes you more approachable and human. This is one of the best LinkedIn summary examples for job seekers. 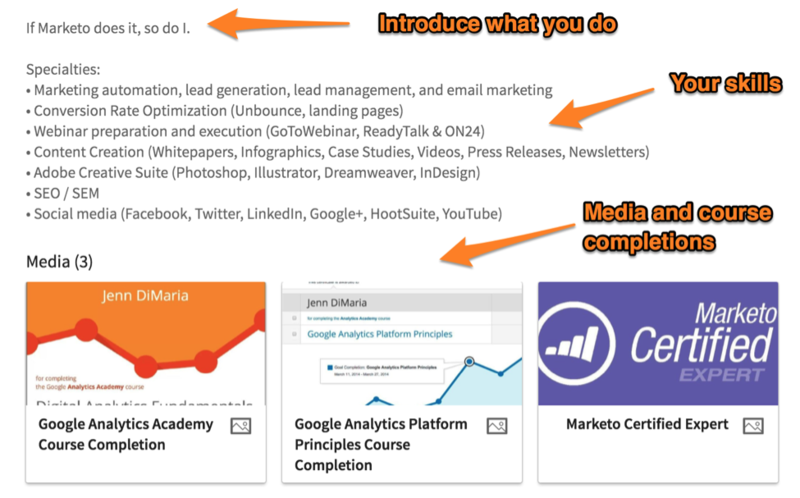 One quick trick to optimize your profile (and get more eyes on it), is to add keywords at the bottom of your summary. Not only will this show your specific skills right at the top of your profile, but recruiters will see what you have to offer. The trick is to get specific. One of our favorite LinkedIn summary tips is to include a glimpse into your portfolio. If you have any articles, slideshares, or blog posts you’re proud of, upload them as media. Feel passionate about your work outside the office? Let it show in your LinkedIn summary. Giving a peek into your personal life can help build a stronger sense of social capital (aka collaborating and connecting with those you work with). It’s the same reason why water cooler conversations bring us together. Thinking about how your passion relates to your personal and professional lives, then writing it out as: “Professionally, ______; personally, ____. Use storytelling to your advantage. Listening to stories increases our levels of oxytocin (aka “the love hormone”) so we become more emotionally engaged. It works in your LinkedIn summary, too. Introduce yourself as the protagonist, then string together your life phases by connecting them with an overlapping theme. Why it works: It’s the string of pearls, a writing technique that pieces together the persuasive details strand by strand. Each sentence builds upon the one previous. If your objective is to drive more business, try putting your industry front and center. That makes you the invisible player. It works if you’re offering a service that will solve people’s specific pain points (think: sales or recruiters). Why it works: This escape from an undesirable reality gets people to respond. Pain motivates us more than pleasure, so pointing out how you can solve an issue causes people to take action. Identify the main pain point your industry solves. This becomes your third sentence. Then, drive them to action so they can make this change happen. Want to see behind the “Send” curtain? Know when your emails are being opened. This example points out your background, philosophies, achievements, and skills all at once — but it’s also concise. Consider it your brief autobiography. Why it works: Humans are skeptical creatures, so you need to establish credibility to earn trust. Laying out your credentials, awards, and skills proves your worth and sways your audience to act. This one works well if you function in a very specific role and/or have a strong skill wheelhouse you want people to see at first glance of your profile. Hint: this is one of the best LinkedIn summary examples for job seekers and consultants. You can improve your LinkedIn search rank (or LinkedIn SEO) by including your qualifications as keywords. The higher you rank, the more likely a recruiter will find you. First sentence: “If ___ does it, so do I” ← A quick quip explaining what you do. Bullet out your keyword-specified specialties. Add any media that further displays your hard work. This one’s for the creative types. Like a classic novel, your LinkedIn summary can draw eager readers with a great hook. Good writers know to include a little tension in their storytelling. How do you apply this to a business profile? Illustrate a situation that captures the essence of your role in an exciting way (see example below) to leave readers on the edge of their seats. Figure out your role focus, at its core. Examples: closing new customers (sales), keeping customers happy (customer success), building out an awesome team (recruiting). Lastly, tell them how to take action. Too busy to write a summary? Use this shortcut and you won’t have to type a word. And just like that, you have a summary! Too easy. P.S. – Check out more ways to optimize your LinkedIn profile here.